As often happens Google released pretty quietly what we can define a new and potentially ‘’killer feature’’ available in Google Optimize. What are we talking about? But Personalization, of course! 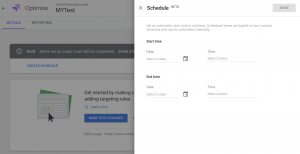 Until now Google Optimize made available to marketers the possibility of setting up A/B Test, MV Test and Redirect Test. From now on Optimize – in addition to short- time testing – allows to create customized experiences on websites in order to show relevant, tailored versions and compelling messages/contents to specific buckets of users. That was the feature any insider was waiting for and particularly we believe it will be much more appreciated by people dealing with Analytics and Conversion Rate Optimization on a daily basis. The feature was already available inside the tools provided by Google’s competitors, though. The possibility of personalizing the message/content according to a specific target of users, the full integration with Google Analytics and the fact that it’s free are good reasons to make Optimize more and more appealing for the market. Besides Optimize 360 users can also reach specific Analytics target Audience. A Personalization is different from an experiment. A Personalization is a set of changes made to a website for a specific group of visitors and can run forever with no variants. The changes are shown to everyone who meets the targeting conditions. 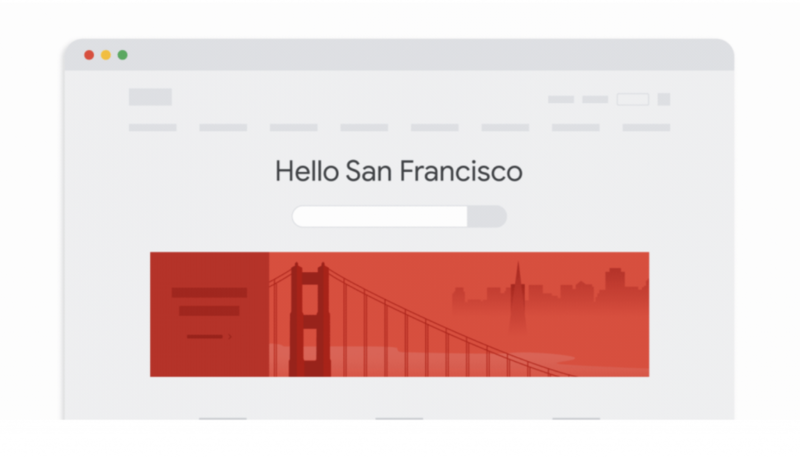 Google Optimize makes available two different kind of Personalizations. Let’s see what it’s about. 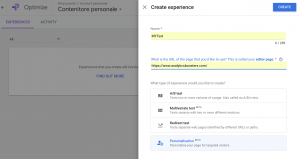 Sign into your Google Optimize account and click Create Experience. Enter a name and the URL of the web page to edit, select Personalization and then click Create. You will land on a kind of ‘Personalization Home Page’ with two buttons. Click ‘Make site changes’ to edit the webpage. Click ‘Add targeting rule’ to choose who is eligible to be included in the users’ segment. Before editing or adding the segment pay attention to the column at your right: the item ‘Measure this’ is unchecked by default! 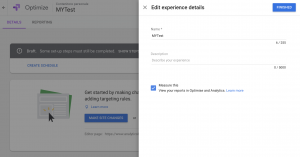 By checking the box, Optimize sends non-interactive event hits to Google Analytics where eventCategory=Google Optimize and eventAction=experience ID. Enabling measurement thus allows to view the results in both Optimize and Google Analytics reports. Clicking on ‘Schedule’ you can define a start and end time for the Personalization. Now you can choose if setting up a targeting rule first and then edit the changes or viceversa. In the screenshot below as an example we are going to delete the home page slideshow only for returning users that land on the page after two days from their first visit. At this point you only need to click Start to run the experiment and wait for the results. You need to access the experiment variant up and running and clicking on the menu of the winner variation you can create a Personalization. In this way the variant will be showed to all users that match with the targeting rules set up for the test. If you need to modify the rules or edit the variant page you have to create a draft and then publish it. 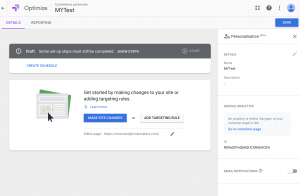 The new Personalization feature reinforces Google Optimize as a valuable tool in the Testing & Personalization software market, due to its integration with Google Marketing Platform ecosystem. At the moment the feature is in an early stage, but it has a great potential if we consider the integration with Analytics, Tag Manager, Ads and so on. Moreover according to Google’s announcement ‘more personalizing features are on the way’. So we only need to test the new feature and wait for further developments.